As promised, here are some thoughts on the federal leaders from the BC NDP convention. Since every leadership candidate was in town for the town-hall, most were sure to be as ever-present at the convention as possible. 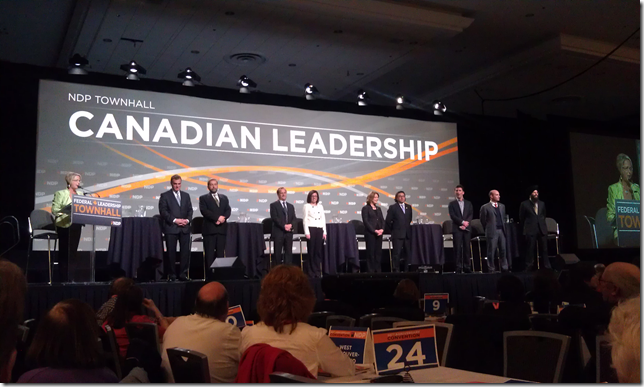 Outside of the debate though, only BC MP Nathan Cullen had access to the convention floor (pictured on right). I briefly dropped in on Brian Topp’s event at The Lion’s Pub on Friday (he held a second on Saturday). He said hi, was quite approachable, and seemed more genuine then the media portrait of the backroom operative. He mentioned how he hoped to push the NDP to adopt stronger policies like his tax-the-rich scheme. Overall I was impressed. Unfortunately he didn’t come off well to many during the town hall and many were unimpressed when he exceeded his intro time – which was only 30 seconds. Nathan Cullen’s remarks and approachability throughout the convention really impressed me. He was one of the most sincere speakers during the town hall, making sure to reference his young twins and getting some memorable jabs in – Harper’s $100/month childcare program is a “slap in the face” and the “racist Indian Act” needs to be ripped up. I stopped him briefly on the floor and said I was glad he was willing to question the monarchy. He commented how striking it was that Canadians have never been asked if this is the system we want. On the joint nomination issue he reiterated that he would leave the decision of whether to run one to local constituency associations to decide. His commitment to democracy and grassroots was quite refreshing. Finally, he mentioned to me (without my prompting) how he “hates ideology”. He mentioned he was raised Irish-Catholic during the speeches but I’ll have to find out how well that upbringing stuck (I’ll try to probe each of the candidates beliefs before the vote). The only other candidate I talked with was Niki Ashton. I first said hi at her both during the early part of the convention, but I also attended her hotel-room (all the bars were booked by other candidates and Christmas parties) “New Politics Pub” party until the hotel managers shut it down. Many are rightly noting how impressive of a speaker she when contrasted to the other candidates, a person sitting next to me commented how she was the only one to fit a bit of policy into her 30 second introduction. She also is one of the most friendly and approachable candidates. She is smart and open. She’s quickly working her way to the top of my ballot. During the town hall I wasn’t really impressed with Robert Chisholm (other then the fact he kind of looked like he should be a James Bond actor). While his ideas were in the right place (they all are), he definitely didn’t stand out. Similarly, I found Romeo Saganash to be an impressive and intelligent person, but wasn’t won over on his speaking (although Twitter seemed to suggest he had a cold). I could see Saganash being a great diplomat or cabinet minister. Thomas Mulcair spoke pretty slowly – likely as a way to get his point across – but he still felt insincere to me. Paul Dewar did fine at the speeches, again emphasizing support for the grassroots but also discussing the need to get away from a paternalistic view that women need protected and move toward building respect and rights for women. His latest promise is to restore the public party subsidy, but to tie the level of support to the number of women nominated for office. Peggy Nash had the most vocal (almost to the point of being obnoxious) supporters, all wearing “Team Nash” t-shirts. She didn’t stand out during the town hall but she still held her own. She again emphasized the need for a strong, stable economy based on social justice and the environment. During the convention she also released her LGBTQ policy. I wasn’t overly impressed with her the first time I saw her but it’s good to see her releasing some substance. FInally, Martin Singh actually really impressed me while on stage. He is a confident and commanding speaker. Unfortunately his position can be summed up by pharmacare and being business friendly. I also maintain a distance due to his involvement with the Faith and Social Justice Committee and his desire to use the race to showcase his religion. I generally like the NDP as a party but I find Carole James to be abrasive what do you think?